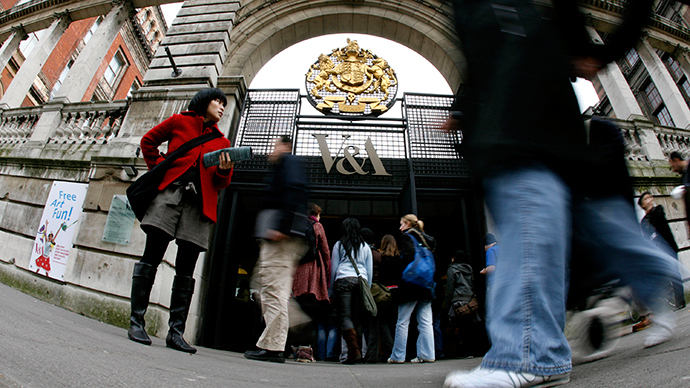 The Victoria & Albert Museum in London has removed a depiction of the Prophet Mohammed from its website amid security concerns three weeks after the Charlie Hebdo attacks in Paris. When asked following the attack on the French satirical magazine Charlie Hebdo in Paris, in which 12 were killed, the V&A said it didn’t have any images of Mohammed. A US expert, however, later provided a link to a poster by an Iranian artist in the museum’s collection, with the inscription “Mohammed the Prophet of God.” The page was deleted last week, but can still be found in a cached version. “Unfortunately we were incorrect to say there were no works depicting the prophet Mohammed in the V&A’s collection,” the museum’s spokeswoman, Olivia Colling, told the Guardian. However, similar images have been displayed around the world without provoking outrage or violence. In 2013, the Tropenmuseum in Amsterdam showcased a contemporary Iranian image of Mohammed, hung next to a Christian icon. The museum didn’t receive a single complaint for the exhibition. “These images are a real eye-opener, a powerful example of Islam being different and more diverse than many imagine,” Mirjam Shatanawi, the Tropenmuseum’s curator for the Middle East and North Africa, told the Guardian. “If Muslims feel offended by images made by other Muslims out of reverence for the Prophet, I’m not sure if the museum should decide not to show them. It seems like choosing one interpretation of Islam over the other. These images are not made to disrespect but – on the contrary – to honor the Prophet,” she added. In 2007, the British Library displayed an image of the Prophet, but with his face veiled, in its Sacred exhibition.